Binding is my least favorite part and I was honestly dreading it for this one because it’s the biggest quilt I’ve done so far. 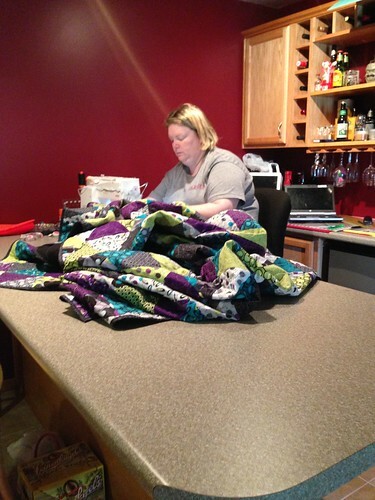 But when I decided to move my sewing machine out the bar in our family room, the binding went on so much quicker than normal, when I’ve got the quilt draped over my left arm/shoulder and trying to maneuver it through the machine. True to form, I didn’t keep up with the group, but I made it all the way to week 3, piecing rows, but week 3 lasted 6 weeks instead! 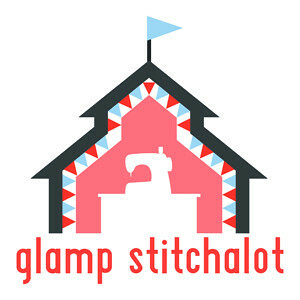 (Here’s the pieced top post.) 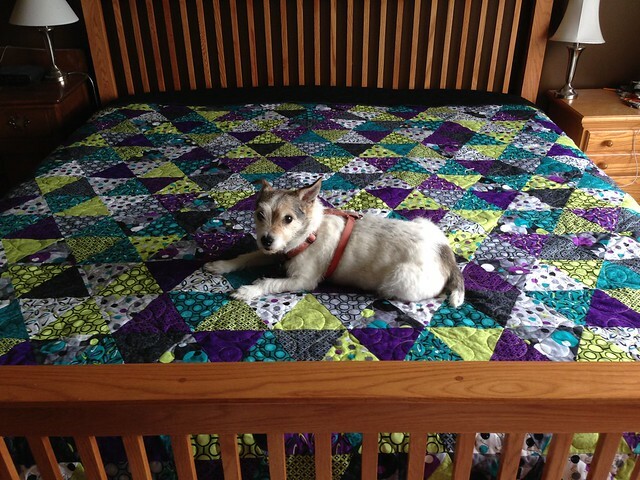 That’s because hubby wanted a ‘bigger’ quilt, but he never really told me how much bigger. So he kept buying me fabric (3 sets of 18 FQs), and I kept pressing, cutting, and sewing triangles until I/we wound up with it this size. I hope he’s happy with the size, there’s no going back now! The finished size is 93.5×96″. Here’s an outdoor pic. It’s cropped a bit – it got a little wonky in the breeze, and my models are vertically challenged! But I wanted you to see the wonderful colors in natural light. 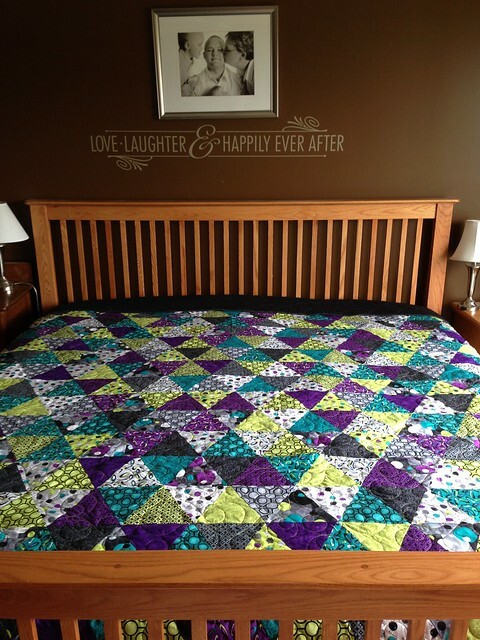 This entry was posted in Quilts, Uncategorized and tagged finish it up friday, Triangle Quilt Along. Bookmark the permalink. 12 Responses to Triangles…Finally Finished! Yay for your finish! Your quilt is so pretty and all the points are so nice. I love the color combo…….great job! You’re too kind, Beth. I only post pics if the nice points! ;). Thanks for stopping by! Oh, those colours sparkle! 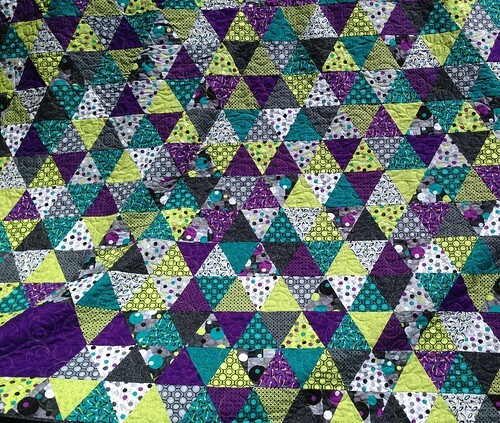 I love triangle quilts and yours looks like a beauty. Congrats on a wonderful finish. Happy weekend! I really like how the colors and the prints work together. Great job! I LOVE the colors in this quilt. You did a beautiful job! Congrats it is beautiful and I truly love it, but purple is my favorite color! I participated in the Triangle Quilt Along also and now we are new bee mates – Promise do.good!